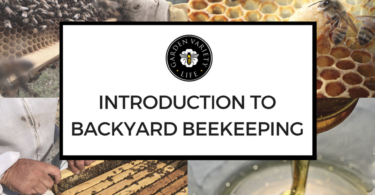 Hi, I’m Cricket, the host of GardenVariety.Life. 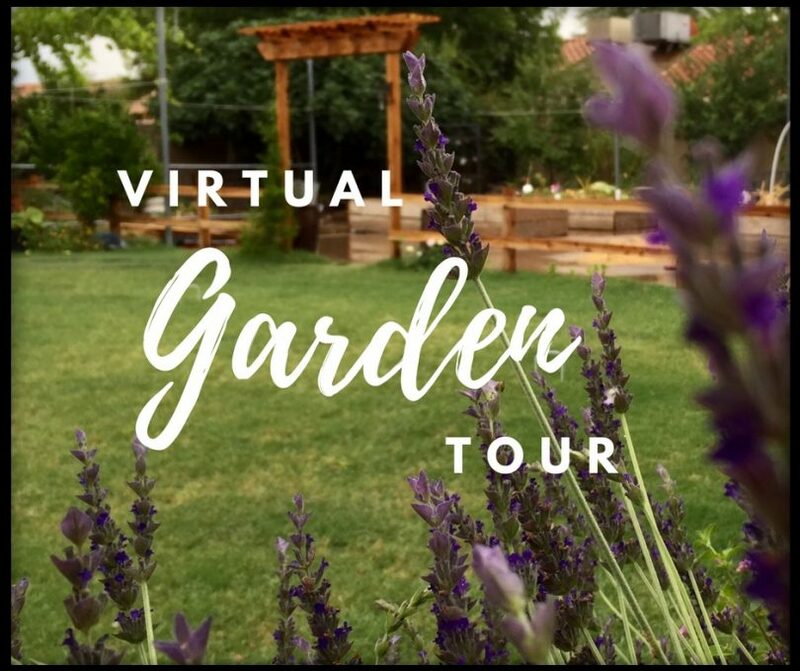 I’ve enjoyed showing you some amazing gardens on the Virtual Garden Tour, and I hope to show you many more in the coming weeks. 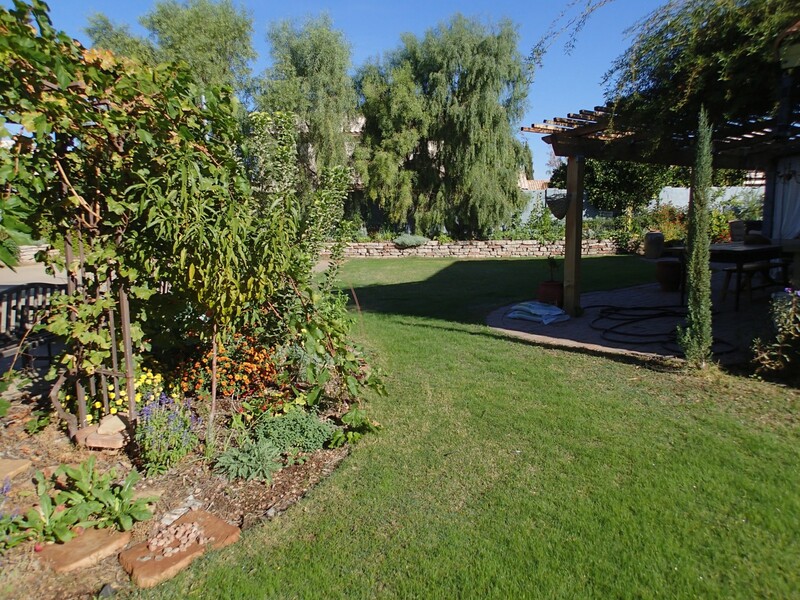 Today, I would like to take you on a little tour of my garden here in North Phoenix. Since moving here from Seattle in 2006, I’ve made a lot of changes as I’ve learned to garden in the desert. I’ve also taken a lot of pictures along the way, so the only hard part of telling you the story of my garden was narrowing down which photos to use. Our garden is a family space where my children have been growing and learning, which is why I like to call it the Learning Garden. 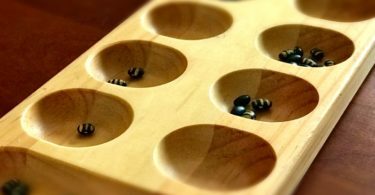 Not only has it been a part of our homeschool experience when the kids were younger, but it has also been a learning place for me. 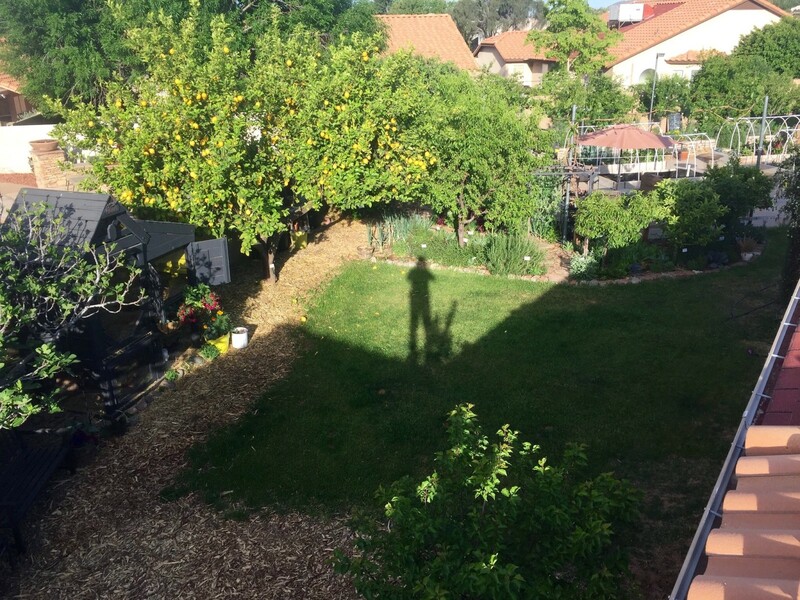 Here is a tour of my garden through the last 10 years, begining with what it looks like today so you can get an idea of how much it has changed through the years. This is our garden today. We were putting a bat house up so we decided to take some photos too. This is a view of the west part of the garden. 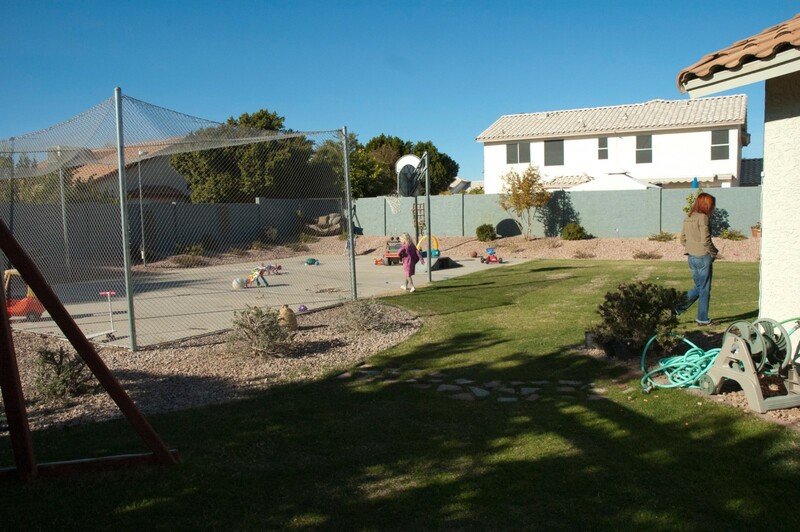 Facing the southwest side of backyard. View from the Southwestern corner of the sport court. 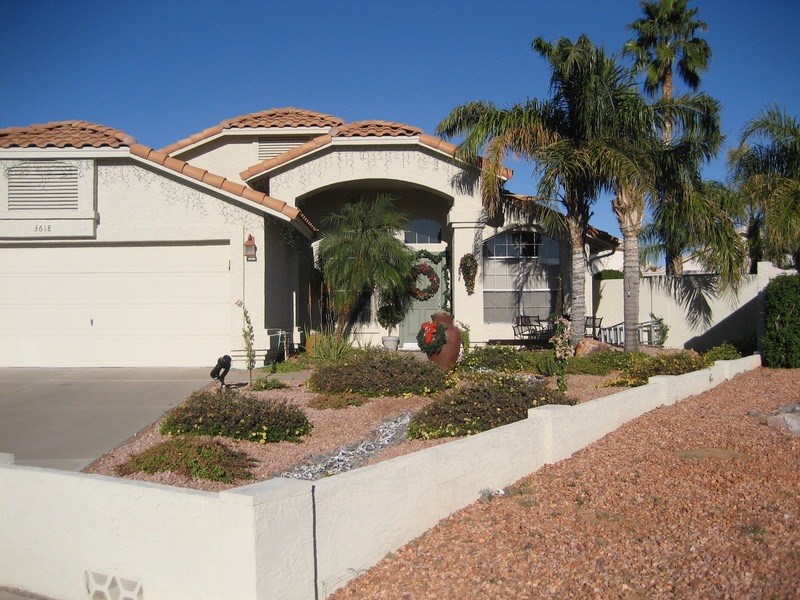 In 2006 the front of our new home consisted of a simple arrangement of palms elephant food, and loads of lantana. Our backyard was basically Texas sage, bougainvillea, and more lantana. Oh, and lots and lots of rocks. At first I tried just putting stuff in the ground and expecting it to grow like it did in Seattle. I quickly learned that I knew nothing. 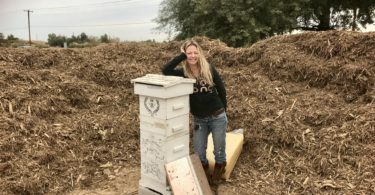 Through lots of research and the wonderful forum on the Phoenix Permaculture Guild website (Now Valley Permaculture Alliance), I started to realize I needed to do things differently. I started with making small gardens with recycled concrete in out of the way areas, trying to work in between the existing plants. Every season my imagination grew bigger and so did my garden. We planted Willow Acacia trees at the top of the slope at the north perimeter of the garden so that we could have more privacy from the 2 story house next behind us. I also wanted some more vegetable garden space so we built three 3 X 8 raised beds in front of the trees. Those lasted for about a year until one morning I discovered my neighbors down the street had removed their back patio. As the landscapers were loading the broken concrete into the dump truck I quickly called my husband to see if we could use it to build raised beds. He said yes (though I don’t think he knew what he was getting into at the time.) I asked the workers to dump it all in my driveway. They looked at me funny, but that is exactly what they did. The next weekend, for our 19th anniversary, we rented a Bobcat and started digging. If this looks like a great big puzzle to you, you’re right. That’s what it feels like putting it together. Slowly, we dry-stacked a 2 foot high wall at the base of the slope of the perimeter of the north and west walls. I had to wait 6 months to find more concrete to finish the west wall. We back filled the wall with topsoil and compost and immediately planted. Everything was growing and thriving. 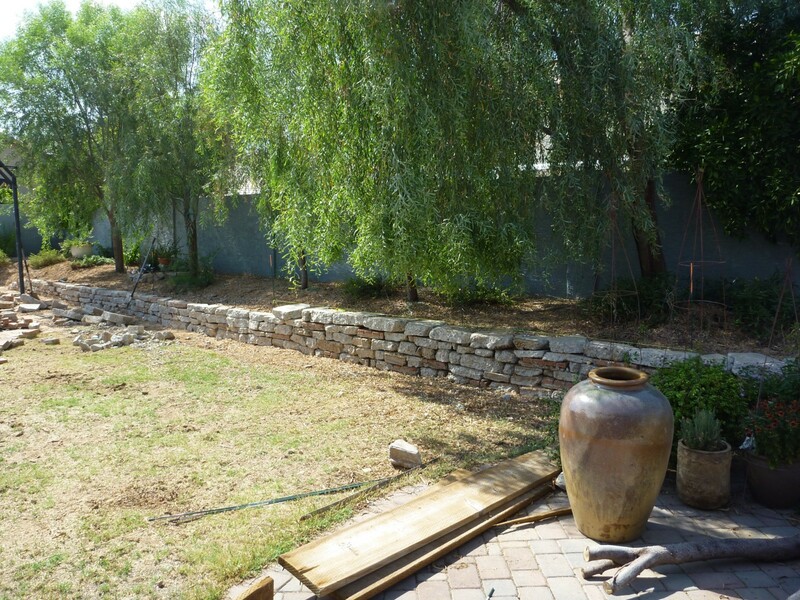 Here you can see the wall finished in the background and the newly planted fruit trees under planted with herbs, flowers, and vegetables where there used to be Texas sage and rock. The new patio and arbor are on the right. The kids love harvesting! It’s always fun to take an empty basket out to the garden and come back with it full. 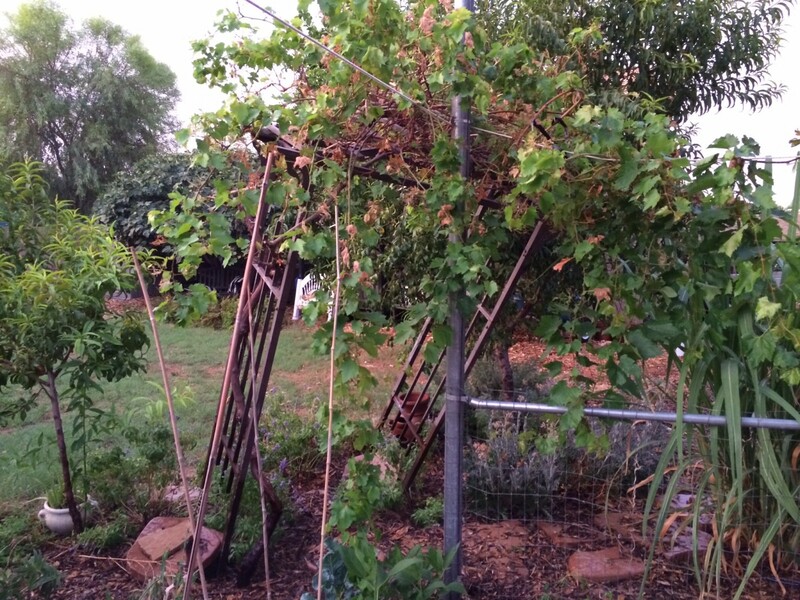 Then in July 2014 a Microburst took out the Willow Acacias and wreaked havoc on the rest of the garden. I was in Wyoming when this happened. Taylor said it sounded like a train came through. Needless to say I was sick when I saw the pictures he sent. 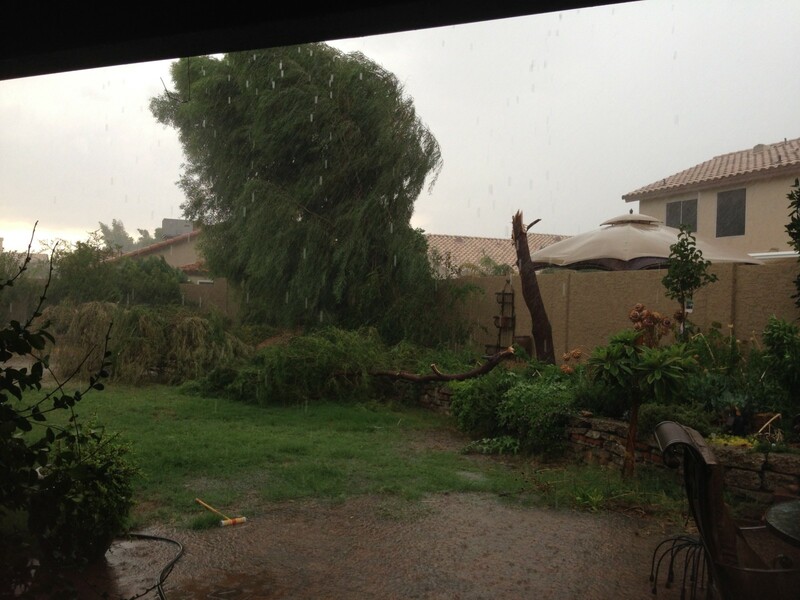 The rest of the yard had only minor damage, but it still wasn’t pretty. Losing the trees made us feel so exposed. 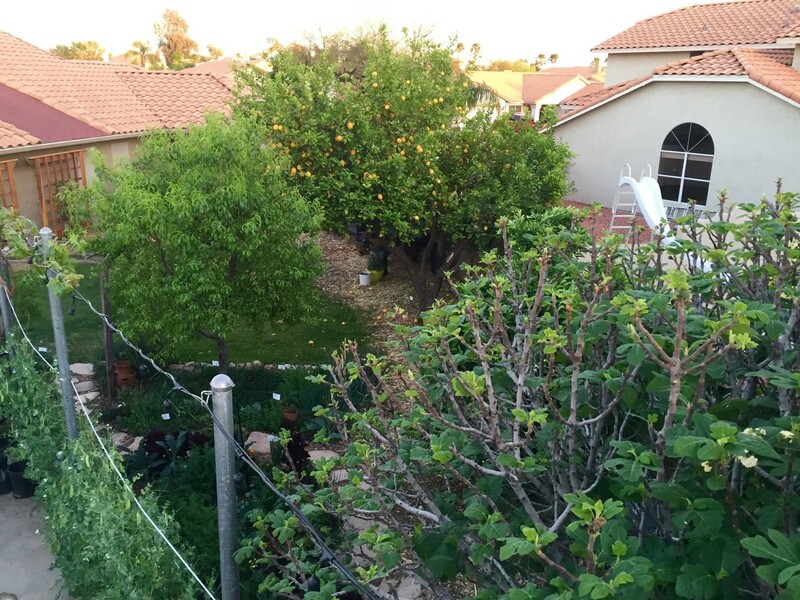 I quickly planted bamboo a pomegranate, and some peach trees to someday fill in. Lots of veggies too, of course. The benefit was that we had more light and things took off. 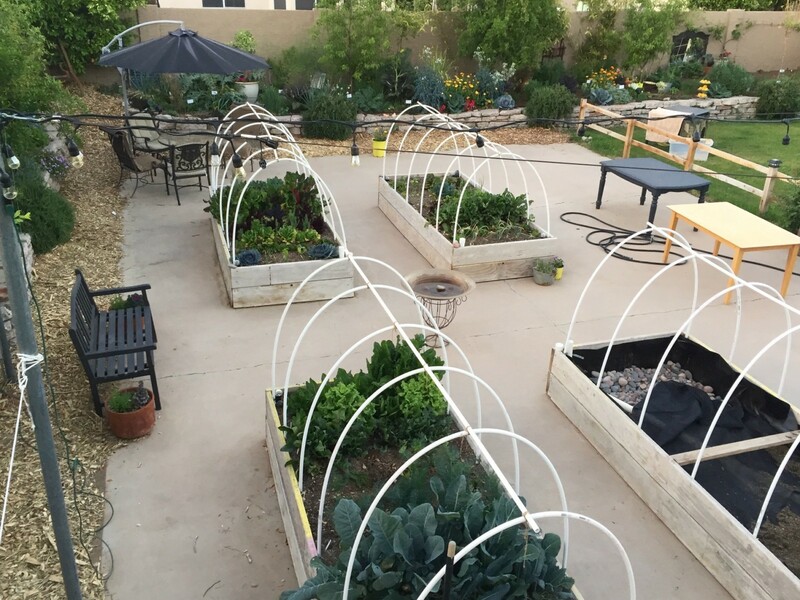 In 2015 we added four raised wicking beds on the sport court along with a fence and trellis. 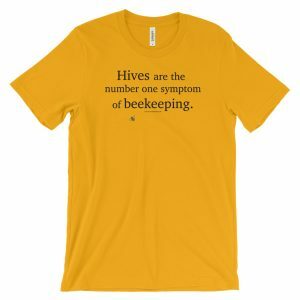 We added bees for pollination and honey. 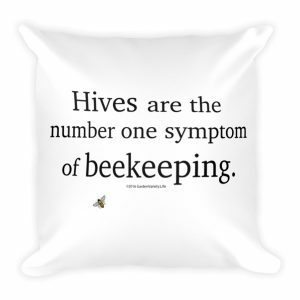 Read more about bee keeping. Chicken coup to the left was made out of our old playset that used to have swings and a slide. Check out my post on how we made it. 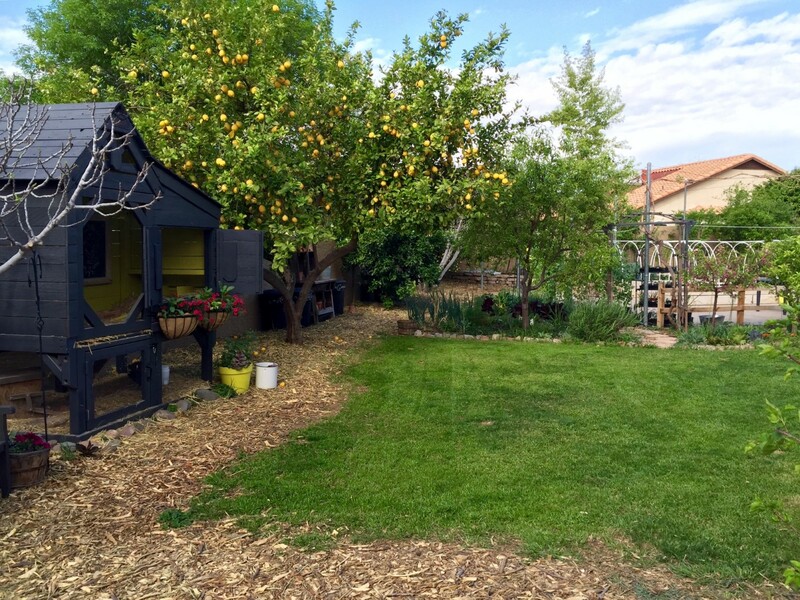 Both the front and back yards produce a lot of fruit and vegetables and a beautiful environment to just be in. 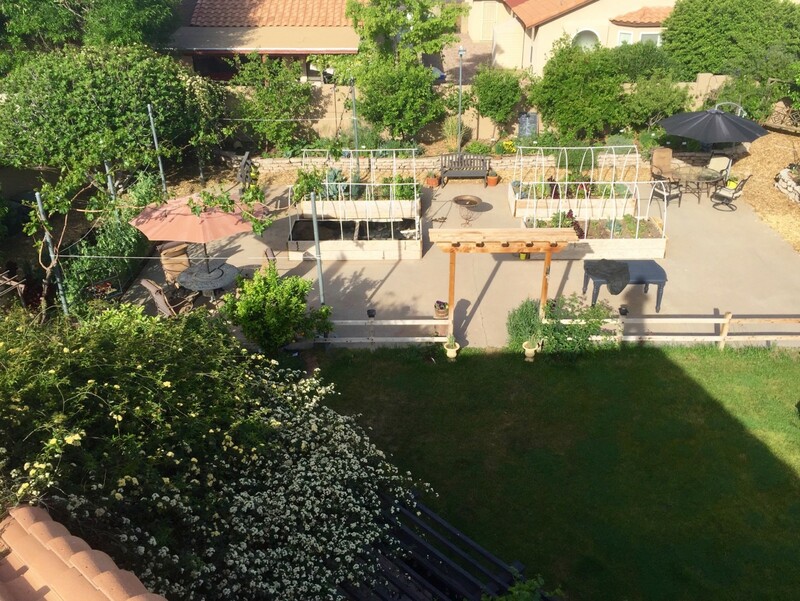 Some specifics about our garden. Everything is on drip irrigation. 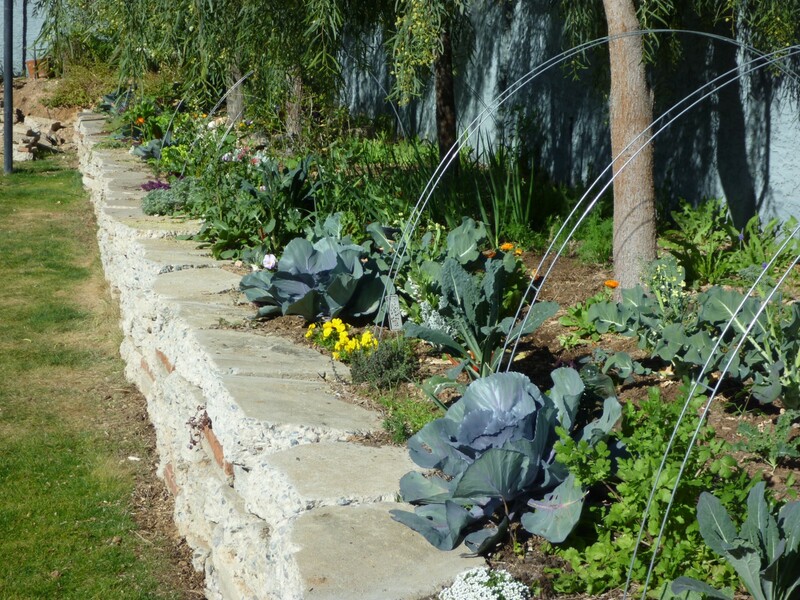 I followed the examples of Vynnie McDaniels and the Master Gardener Demonstration garden to lay my irrigation out. 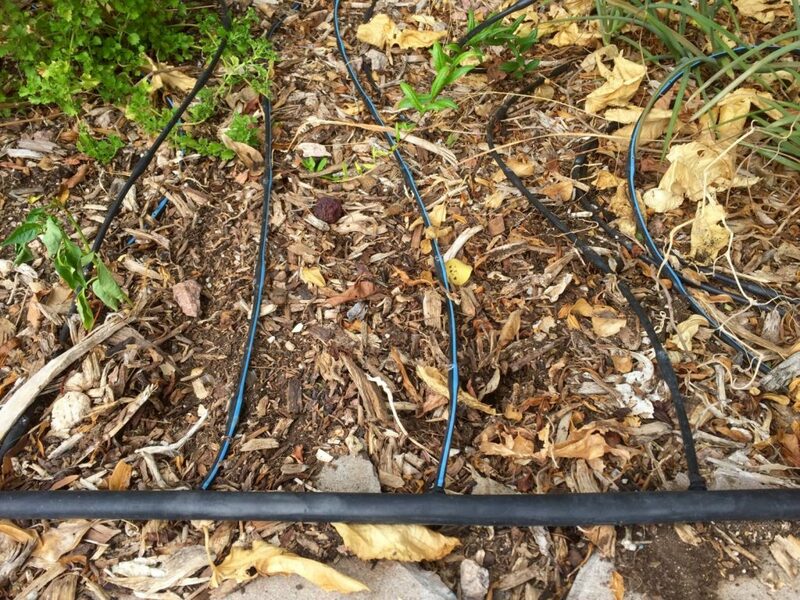 It basically is a 1/2 in black poly tube with emitter tubing every 6-9 inches that runs perpendicular to the 1/2 in tube the length of the garden. Kind of like a giant comb. It is on a timer that varies throughout the year. The Wicking beds are watered from the bottom up so that the plant roots “wick” water up. They use about 52% less water. I’m still experimenting with the right soil mix. My beds are made from recycled scaffolding planks. We also have 3 rain barrels, which I use to hand water pots. All of the garden is heavily mulched with free mulch from tree companies. My last batch was very thorny, so I recommend checking the truck’s contents before accepting the dump. Tidy Tree is a very good choice. As is Integrity Tree Service. You can call and get on their list if you are in their area. 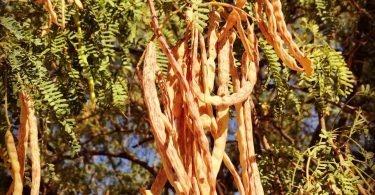 Here is my list of plants that perform the best for me year after year. I hope to install an outdoor washing machine to route the gray water to my garden. I already dry my clothes on the line outside, so it makes sense and is much cheaper than running a gray water system from my existing washing machine. We also want to build a Cobb oven for baking bread. 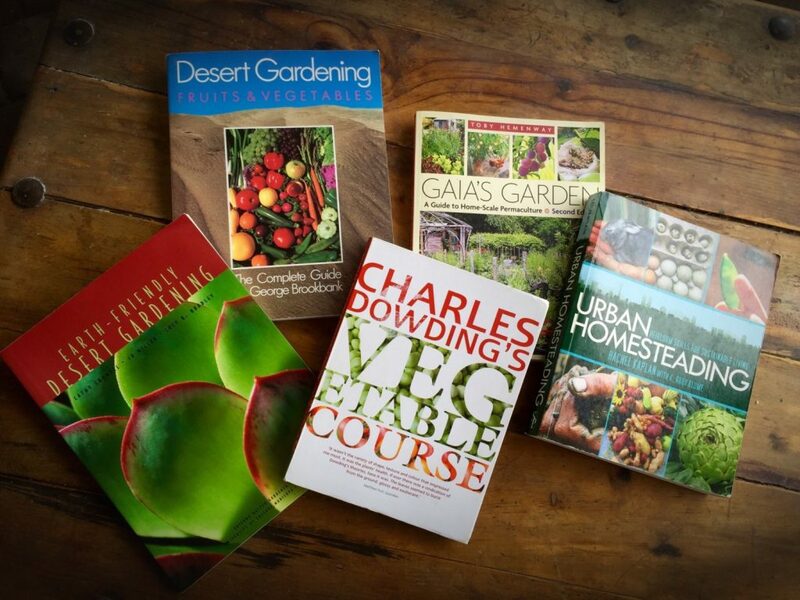 Some of my favorite gardening books. Very Nice Crickett! Thank you for inspiring us all! You have done SO much work on your yard, and it is incredible. Your use of materials is impressive. 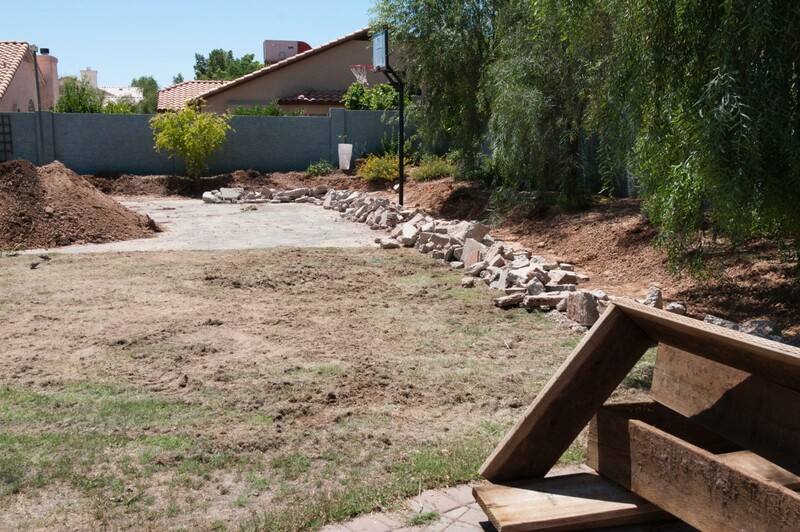 I am more motivated than ever to get started on filling in our backyard. It has never had any plants on it and was just covered with chunky granite. Horrible. The list of what you have and what has done well is very helpful. Happy gardening! Thank you Janice. Little by little a garden grows. I’m so very happy that my garden contributed some ideas for your own garden. Every season brings something new, but there are definitely those plants that I can rely on to be there year after year. Happy planting! Cricket your yard looks stunning! I love all you have done and as always you inspire me! I love your enthusiasm to use gray water for your garden. A Cobb oven, wonderful idea! Sure hope you post about it! Thank you Sandy. Doesn’t a Cobb oven sound fun? I’m hoping to collect some people who want to learn to do it together, and then help each other with the construction. Stunning and inspiring! Thank you so much for sharing. So much fun to see how your garden has grown from the first year we came to visit. I can’t wait until our next trip down to AZ. Thanks Melanie! I’d love a visit from you, although I wish I could visit you at this time of year. Love your firepit! This is so wonderful Cricket, I’m so inspired!! We’re putting in raised beds and trying to plant more edibles and it’s amazing to see what you’ve done. We’ll see if I can get some things to grow — lots to learn, but so much fun. Can’t wait to see your cobb oven!! 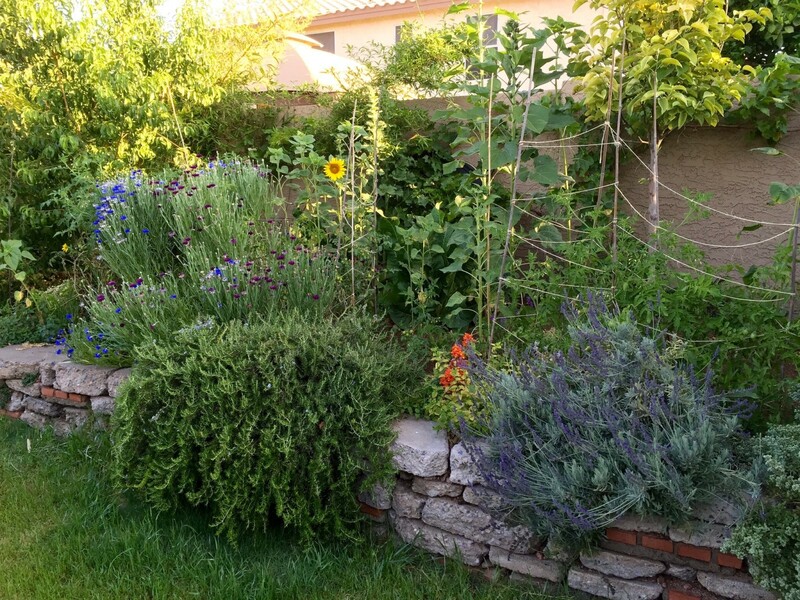 What a beautiful, thriving garden! I would love to just come and hang out in that space, I bet if feels SO good =-) This is by far, my favorite kind of yard! You are definitely inspiring me and I am so excited to have met you last night! I look forward to some great meetings and lots of inspiration!!! I’m really enjoying your blog too! Thank you and I look forward to reading more. Thank you Virginia! I’m glad you checked it out. I really enjoyed meeting you too. 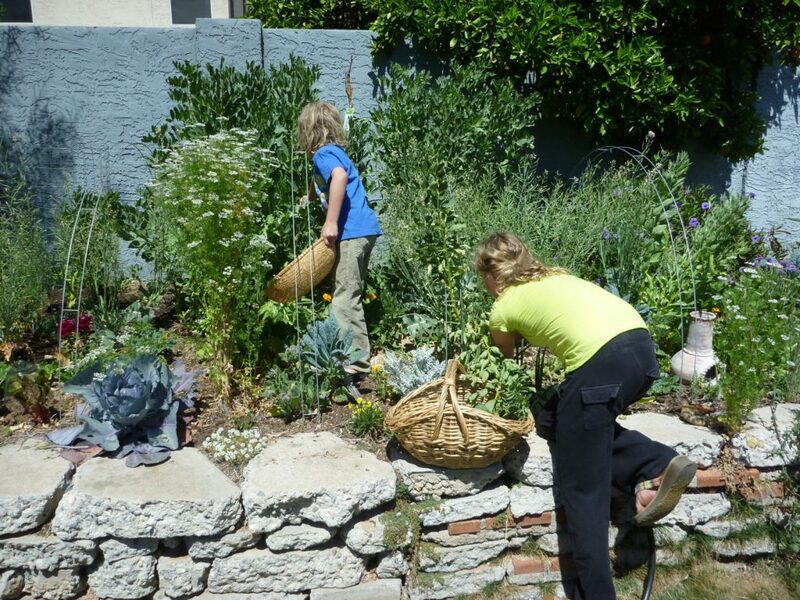 It is so good to get the fundamentals of permaculture ingrained so that it flows naturally into what we do. 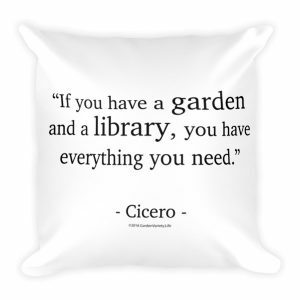 Having the book club for The Earth User’s Guide to Permaculture is a genius idea. Good job making it happen. I love your site. I am in the master gardner class you are currently a mentor for. Would love to pick your brain on my yard!!! Thanks Rachel. I’d love to chat about your yard. Catch me at the next meeting.